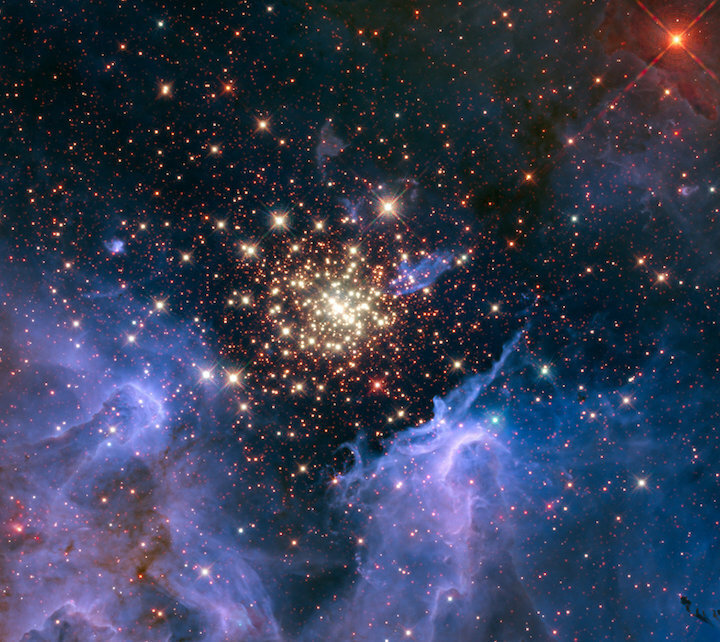 Cosmic radiation can come from clusters of huge, hot stars like NGC 3603, found surrounded by this colorful nebula 20,000 light-years away in the constellation Carina. We're all familiar with light, in some form or another. Some light we can see, like the relatively narrow visible spectrum incorporating the colors of the rainbow. Other light we can't see but we can feel: For instance, the heat we sense from the sun on a warm summer day is from the invisible infrared radiation pouring out from our parent star. And there's even light we can only detect through extreme doses: the ultraviolet burn from a long day at the beach or the hazardous effects of gamma-rays from a radioactive object. It's this extreme light that has the most exotic sources in the universe. While most forms of radiation come from the trillions upon trillions of relatively serene stars or the ultracool background of leftover light from the Big Bang itself (the cosmic microwave background), the cosmos is full of some fantastically energetic events. And in those events we find some truly out-this-world methods of manufacturing radiation. Imagine a typical radio antenna, which generates radiation (in the form of radio waves for you to tune into on your car stereo) by waving electrons up and down its length. Back-and-forth, forth-and-back, those accelerating, charged particles send out sloshing radio signals from the antenna. Imagine cranking up the speed of the bouncing electrons, sending them frantically traveling up and down the antenna, in the process generating stronger radio waves. That would quickly get exhausting, so to make things more efficient, you bend the antenna into the path of a circle and use something like superpowerful magnets to send those charges screaming along at close to the speed of light. Now, "acceleration" can mean stopping and starting, as in the case of a linear radio antenna, but it can also mean changing direction, like following the path of a circle, as in the case of our new contraption. So those whirling electrons still manage to send out radiation and are now capable of emitting high-energy ultraviolet and X-rays. And instead of spreading that radiation around in a broad splash, it's concentrated into a narrow beam, looking more like the headlights of a car turning a fast corner. This radiation was first observed in a synchrotron (a device for doing exactly as described above), hence the name synchrotron radiation, but nature is able to make this in abundance: Anytime strong magnetic fields get together with electrons, like the jets blasting out of active galactic nuclei, the synchrotron party can get started. We all know that the speed of light is the speed of light — the fastest speed of all. Nothing can ever beat a beam of light in a one-on-one drag race … in pure vacuum. But when traveling through a material, the speed of light can slow down considerably. In water, for example, radiation travels at only three-quarters of its usual blistering pace. And with light so hobbled, there's nothing stopping a swift-footed particle from beating it in the speed game. If an object travels faster than the speed of sound through a medium, like a supersonic jet blasting through the atmosphere, it creates a pileup of sound waves called sonic boom. By analogy — and analogies are the best way to go here, since the physics gets really tricky to describe — a charged particle going faster than light through a medium creates a pileup of light waves — aka radiation. This ultraviolet light, known as Cherenkov radiation in honor of its discover, Pavel Cherenkov, is typically seen in nuclear reactors and high-energy physics experiments, where fast-moving particles zip through baths of water. They're not just a byproduct of Big Science, either — they're used in cutting-edge experiments to track the origins of superhigh-energy particles raining down like cosmic bullets from outer space. The last example has a fantastically German name: "bremsstrahlung," which translates roughly as "braking radiation." Once again, this form of radiation requires high energies and charged particles. In this case, if you have a potent combo of light, fast-moving particles (like electrons) and heavy, slow-moving particles (like protons or atomic nuclei), you get a lot of light with a cool name. As electrons zip around, sometimes they come close to the nuclei, and they get more chances to do so if they have a lot of energy. If the temperatures are high enough, they won't get trapped and form atoms. Instead, they'll just feel a brief mutual attraction (being opposite charges and all), slightly tugging on the electron and nudging it into a slightly different direction than it originally was headed toward. And since a change of direction is an acceleration, and accelerating charged particles emit light, light … is emitted. This can only happen in very energetic environments, so typically bremsstrahlung comes in the form of X-rays. And there's one particular environment in the universe that's just wonderful at making bremsstrahlung: the largest gravitationally-bound structures in the universe. Clusters of galaxies are home to a thousand galaxies or more, all zipping around inside a volume millions of light-years on a side. But the galaxies aren't alone; they're swimming through a hot but extremely thin soup of plasma known as the intracluster medium. This medium is made of — you guessed it — light electrons and heavy nucleons, and when we look at these clusters with X-ray telescopes, we see gigantic glowing blobs of high-energy X-ray radiation: bremsstrahlung.